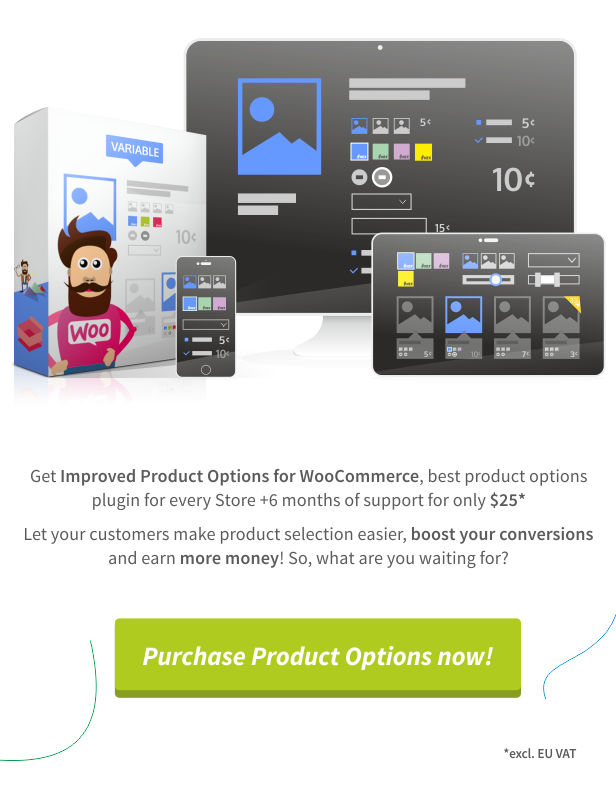 Improved Product Options – The best product options plugin for WooCommerce. Never get out of stock products again! The best product options plugin for WooCommerce. Never get out of stock products again! AboutPlugin Preview Click here!- Shop / Archive Pages- Product - 1 Attribute- Product - 2 Attributes- Product - 3 Attributes- Product - With Custom Fields AWESOME- Simple Product – Attribute Selection- Stepped Selection COOL- Select Box- Border- RoundDocumentation and Guide- Change LogBuy Here! with eyecatching features for both you and your customers. Improved Variable Product Attributes for WooCommerce is a plugin that improves attributes selection in your shop. Improve your customer product selection, set up your shop attribute styles and never show the Out of stock option. Use Text, HTML, Images or Color to show product variation selectors to your customers. Add a unique style to your web shop now and amaze your visitors and clients! Display your improved attributes on the single product pages as well as on product archive pages! Let your customers select the attribute variations on the product archive pages and add them to the cart using AJAX, without having to enter the single pages, or use the plugin to display attributes on product archive pages. Custom attribute names and attribute descriptions are supported! Check the demo at this link. A new feature in the Improved Variable Product Attributes for WooCommerce v2.0.0! Get product attributes directly in your shortcodes, shop page or the product archives! AJAX add to cart support for variable products within the product archives! Let your customers select the attribute variations and add products to their cart directly from the shop pages, without having to enter the single product page, or just display the available attribute options without the possibility to select them. Add to Cart for Variable Products using AJAX is now available on single product pages. 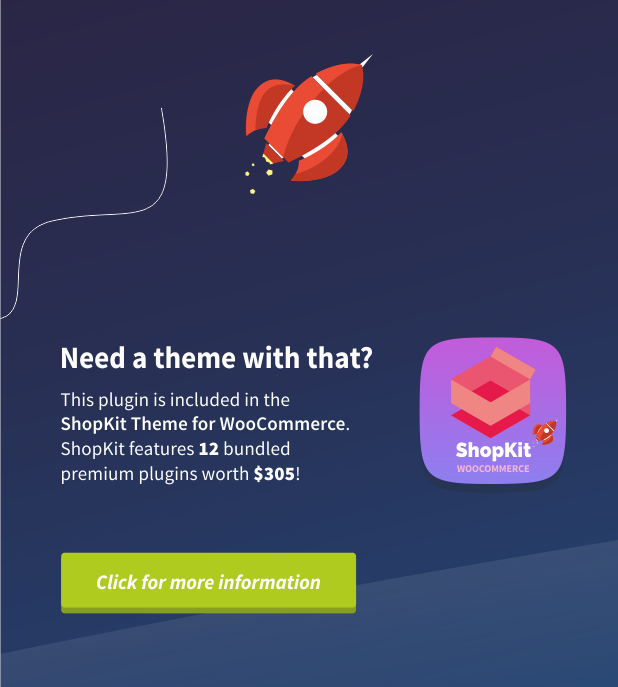 This feature is also supported for the shortcodes, shop and the product archives in your WooCommerce store! The add to cart option is displayed using AJAX as soon as your customers select all of the available product attribute variations. Add dynamic to your single product and product archive pages. Improved Variable Product Attributes for WooCommerce installs itself into WooCommerce interface. Find its options in the WooCommerce > Settings > Variable Product Attributes. Add Customization for each of your attributes, select to display them as Images, Colors, Text or HTML. Set up each variation and it’s Tooltip. Rearrange your attribute order using drag and drop functionality and your awesome new product attributes are good to go! Never show Out of stock options again! Combine attributes and show in stock and out of stock variable products. Never show the nasty Out of stock option. Force users to always get the Add to cart button and therefore improve your shop performance. This plugin pays for itself! The Improved Variable Product Attributes plugin will prevent your customers from selecting unavailable attribute combinations and only let them select the available ones, giving them the option to add to cart only when all attribute terms have been selected. Unlimited customization possibilities! 3 Plain Text styles including border, background and round, Thumbnails as attribute terms – use images for your variations, Colors as attribute terms and even custom HTML for each attribute. Unlimited options! Override as many attributes and their terms as you have in your Shop. Select one of the available Attribute styles (Text, Thumbnail, Color or HTML), set a customization for each term, override attribute name and add attribute descriptions. Making your product attributes look awesome and stand out to your customers has never been easier! Reorder your shop attributes on the single page. Use the drag and drop customization manager to customize your attributes! Select your attribute styles between Text, Thumbnail, Color or even custom HTML! Override each attribute term, set their Tooltip text, change the attribute name and add attribute descriptions. Select to show product attribute terms on the Shop pages as well and enable your customers to select them and dd products to cart or just display the attribute terms without the possibility to select. All from a single page! As all plugins from the Improved series this one also installs itself seamlessly in the WooCommerce interface and overrides default settings on installation. It will feel like it was always there in the first place! All plugin options are located in this newly created tab. Control all your attribute customizations and set plugin options from a single page! Translation Ready! Full WPML Plugin Compatibility! All files are ready for translation. The WPML translation plugin is fully supported! Add Attribute Customization for each language separately. Translate all your attribute options into any language, including tooltips, attribute name overrides and custom attribute descriptions. The plugin comes with .MO nd .PO files included. Spanish language file included. Use it with any template. 100% all templates are supported! Fits responsively into your shop theme style. If your theme doesn’t follow the WooCommerce standards and the attributes don’t appear automatically, you can always use the provided action override fields to insert them manually! Want to go back? Click here! Copyright © 2017 Mihajlovicnenad.com All rights reserved.